​Astrophotography is an extremely exciting branch of photography, yet very complicated as it depends on numerous factors. 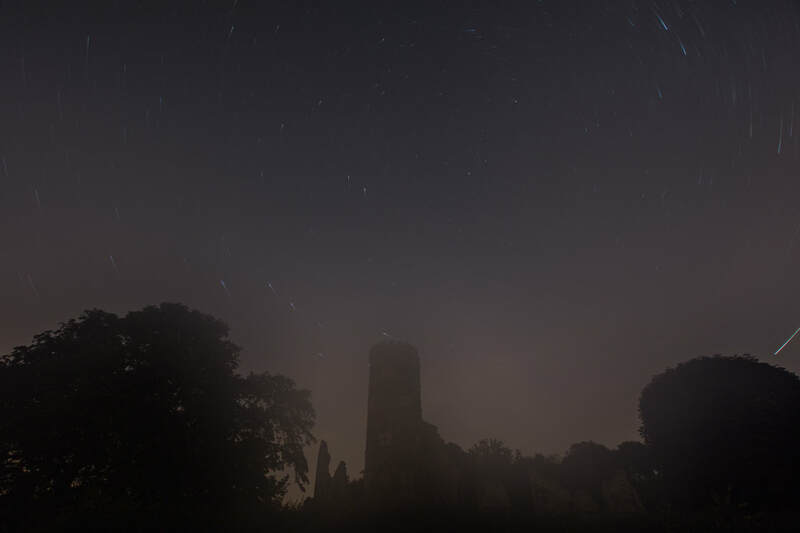 Unlike conventional landscape photographers, who often seek for cloudy and moody skies, astrophotographers aim at working in clear skies (for obvious reasons), a condition not common here in the UK. Also, it is highly desirable to look for a location with little light pollution to maximise the brightness of the stars. For the same reason, a thin or no moon is recommended when shooting at night, thus reducing the chances of going out only to a few nights a month. Finally, it is also important to consider that although the main subject will be the sky, including an interesting foreground is vital for an attractive night photograph. Although I do not pretend to be even called a “photographer” I managed to find out that the combination of all these requirements make astrophotography quite challenging. Although I must admit that I have gone out at night only on two occasions (each with a completely different outcome) the purpose of this post is to give some recommendations for those who would like to have a go at astrophotography for the very first time. In contrast to the numerous atmospheric requirements, very few pieces of gear are essential to get yourself introduced into astrophotography, being the tripod possibly the only absolutely crucial item (and as always, the sturdier the better). Almost any modern DSLR, with a respectable quality at high ISO can do a good job. A wide(-ish) angle lens is generally preferred, although anything up to 35-50mm can be used, as long as it is sufficiently luminous. Finally, you will probably also need a cable release (recommended, but it not be essential unless you want to use exposures longer than 30 s). Therefore, anyone can get started in astrophotography without having to spend a fortune on gear! Once you have your gear ready and your companion tricked, you will have to make sure that you plan your session very meticulously beforehand. Have a good look at the local weather forecast, aiming at clear skies, but paying also attention to temperature and humidity conditions (more on this below). Check the lunar calendar and make sure that your location is in a relatively dark area free of light pollution. There are many tools and applications on the internet to check each of those conditions, and their combination can be very valuable. There are also many tutorials out there that can be of great help. Photopills is definitely a great app to use both when planning earlier at home and on the spot, with multitude of great tools to facilitate the experience (tutorials, videos, planner, augmented reality, exposure calculator, etc). I have recently found out how lucky I was on my first occasion out on a night photography session. 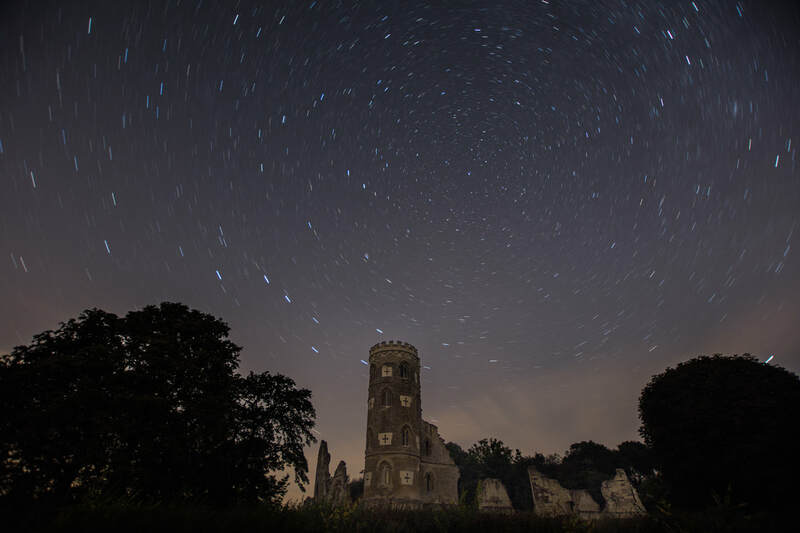 The folly at Wimpole estate seemed to us a very interesting subject and we had previously scouted the location in anticipation, making sure that the access was possible and safe during the night (although we did nevertheless get lost for a few minutes on that night). The weather conditions were great, with completely clear skies and quite a warm temperature, with no moon at all. The sky was a truly wonderful display, which brought me back such fond memories of my childhood spending most summer nights on my grandad’s lap, observing “Sa Carrera de Sant Jaume” (Milky Way). In the end, everything worked quite well on that first night: we arrived, we got our nice shots and went back home safe and sound (after getting a little lost on the way back to the car). Our second night photography session was a completely different story. Everything went well at the beginning, I got a decent 8 min startrail test shot, in preparation for a much longer ones to follow. After the initial test shot, I dropped the aperture to f/6.3 in order to achieve a 25 min startrail shot. I pressed the shutter. It is amazing how fast 25 min go when you are excited trying to guess how wonderful this new shot will come out. However, to my great disappointment, when I looked at the back of my camera I realised that something had gone wrong this time. The image appeared completely foggy but I did not completely understand why at the beginning. I panicked a bit, thinking that maybe there was some condensation inside the lens or even inside the camera body, but I quickly realised that I was suffering from condensation at the front element of my lens. My new friend, the dew, had made a stellar appearance! I wiped my lens with a lens cloth and tried to take a few more shots, just to notice how rapidly the condensation was accumulating again and again in long shots (>1 min). I then decided to use the interval timer of my camera to set up a time-lapse of many short (30 s) shots, with a 10 s break in between, which I used to wipe my lens. Even doing so, the results were very upsetting, as condensation appeared in very quickly and ruined several of those shots. More annoyingly, I manage to notice (only at the very end of the run) that the time-lapse had been a complete failure because I had been pushing the lens in while trying to wipe it out, and so causing the change of the focal length during the series. After that, tired and sleepy, but mainly frustrated, I decided to pack my stuff and not to shoot any more images that night. ​Very reluctantly, I had a look at the pictures the next morning, just to make my frustration grow even worse. A quick search over the internet helped me realise how common this problem is among the astronomy and astrophotography community. Indeed, it all makes perfect sense now that I gave it a thought for more than 2 minutes… It is all down to the so-called “dew point”, which is the temperature below which water vapour in the air starts condensing in the form of liquid water. Therefore, at very high levels of humidity, water will start forming condensation droplets onto any surface that is slightly colder than the air’s dew point temperature. At 100% humidity, the dew point is the same as the air’s temperature! Apparently, there are several possible solutions to this problem, some of which seem much simpler than others. At this point, I think that a lens hood and disposable hand warmers wrapped around the lens seem like the most attainable combination for the next night out. Also, I plan to do some more reading on the subject in order to get better prepared. Among the many tutorials out there, I strongly recommend the one written by Antoni Cladera, one of the creators of Photopills. For a life with plenty of mistakes! Recently, I came to realise that I have spent almost my entire life living in islands. I was born and raised in Mallorca, a small and beautiful island in the Mediterranean Sea. I spent one year in Dublin (Ireland, another island), and since then, I have never lived back home. I later lived for one year in Barcelona (not an island this time, but close to the sea) before moving to Great Britain (island! ), where I spent almost eight years. I then moved to Strasbourg (France), whose historic centre is surrounded by channels of the river Ill, thus forming an island (!) called Grand Île. After two years, I returned to Great Britain, where I am still living now. Ireland is a wonderful place where I have been extremely fortunate to live in, as well as to visit in several occasions. It is a country erected on an extremely interesting history, often quite problematic, which I think has enormously contributed to the development of their people’s nature. I think that even the famous “Irish weather” has forged the personality of that nation. Irish are friendly, funny, curious and very welcoming people. I would dare to say, without any shadow of a doubt, that they are the most Mediterranean-like citizens of the British Isles. Probably after language, food and religion, music is one of the most recognizable features of the cultural identity of a country. That is for sure no different in Ireland, very well known for its musical heritage and tradition. Indeed, Irish musicians have always been right at the top of the worldwide music scene (U2, Sinéad O'Connor, Van Morrison, Enya, The Cranberries, etc… among many others). Irish folk music is one of my passions and was one of the reasons that attracted me when deciding Ireland as a destination where to live. I found it vigorous and rhythmic, it pulls you in, up to the point of getting you immersed in a sort of cathartic state. This is in fact the case for most traditional music around the world, often associated with cleansing and healing powers of both the body and soul. If you are new into Irish folk music, I would recommend my favorite band, Lúnasa. They call themselves “the hottest Irish acoustic group on the planet”, which may seem a bit presumptuous, but I completely agree with their statement. Another reason that dragged me (and many visitors every year) into Ireland is its majestic landscape. The island offers all sorts of different landscape for everyone’s taste: rough and wild coast, mild and smooth rolling hills, calm lakes and forests… However, if one scenery really blew my mind when I visited it, that was the region of the Burren. This is a vast bare glacial-era limestone pavement that gives the landscape a unique lunar-like appearance. Apparently, the word "Burren" comes from the Irish word "Boíreann" meaning a rocky place, which describes the area to perfection. If you enjoy rare and unusual landscapes, I strongly recommend you visiting this region. I am looking forward to my next visit! County Donegal was the target of my recent visit to Ireland during four days in the last week of July. The aim of the visit was to participate in a landscape photography workshop organized by Nigel Cooke. My friend Alex and I attended the workshop and we really enjoyed every minute of it. 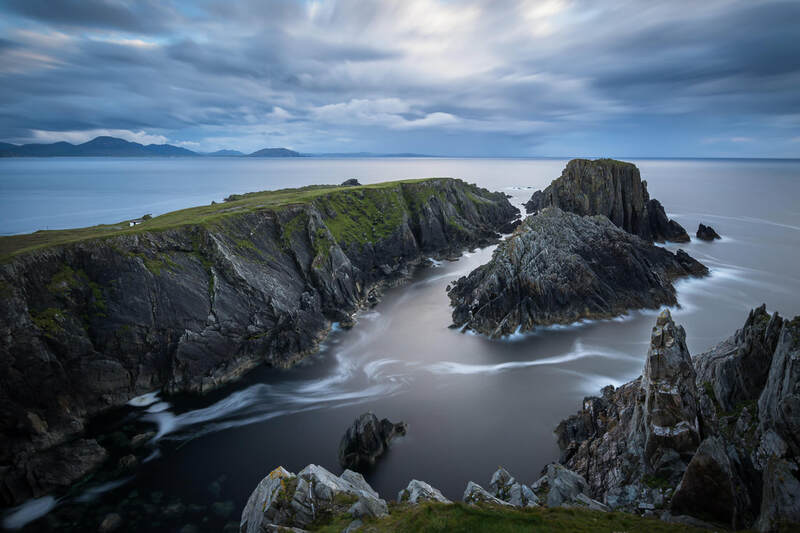 The workshop was centered on the Inishowen and Fanad peninsulas, which I had not visited before but did certainly not leave us with disappointment. The scenery alone is “just beautiful” by itself, but having the chance to visit it with someone like Nigel, who really knows the area very well, turned the whole weekend into a magic experience. The weather forecast was not very promising on our departure from Cambridge, but in the end, it was never that bad for prolonged periods of time. Although we never really got the desired amazing light always loved by photographers, the continuously changing conditions propitiated the right circumstances for the workshop. Indeed, a take-home message from the workshop was that a good knowledge of weather makes a huge difference when it comes to landscape photography, and Nigel certainly has it. He was capable to identify every single “squall” that appeared in the horizon and adjust accordingly based on the conditions. The organization of the workshop was exquisite and completely tailored to our needs. Nigel enjoys teaching and the fact that we were only two of us ensured that he spent plenty of one-to-one tuition time with each one. Although in the end, we decided not to attempt any sunrise (mainly due to the unfavorable weather conditions and the fact that sunrise time in July is at stupid o’clock! ), we had nevertheless plenty of time for tuition and shooting during the whole day. Indeed, tuition and photography discussions did start from the very moment we woke up, while having breakfast, and finished later in the evening after sunset session, while still in the car going back to the hostel. I'm very pleased to announce the launch of my new website. First of all, I'd like to thank you for taking the time to visit. Yes, especially because there are millions of websites out there, miles better than this one. If you did visit however, I guess there is a reason for it... One could be just because I know you and I sent you the link (=pestered you until you visited the site). If that's the case, I'm happy because I achieved my goal; but you should be happy too, because if I sent you the link, it means that I do care about you and respect your opinion. Therefore, please feel free to send any comments and critiques about the site. If I don't know you but you are here, I hope that's not because one of your friends have told you of a weirdo pestering them about visiting his website... Even if that was the case though, it would still make me happy because, again, I'd have achieved my goal of reaching as many people as possible. Also, please feel free to comment about the site. This website will consist of a collection of my favourite images, and so I hope that you like what you see here. I enjoy taking photographs, but what I enjoy even more is getting better at it. I think I am indeed learning a lot in the recent years, and hopefully improving also, and I wish I can continue doing so in the future and therefore you can see this reflected in my work. I don't know how often I will post a blog, but I will for sure try to keep my images updated quite regularly. Welcome... and again, thanks for your visit! All content copyright © 2017 Rafel Cabot Mesquida. All rights reserved.